Country hams are an old tradition in the American South. Fresh pork legs are salt-cured, sometimes smoked, and then dry aged for several months. Because the meat can be very salty, country hams must be soaked in water for a time to remove excess salt. Baked country ham is the perfect centerpiece for any family celebration. Leftovers are great for breakfast with red-eye gravy or served as a sandwich in buttermilk biscuits. Wash the ham with cold water, scrubbing off any mold or dirt with a stiff-bristled brush. Place the ham in a pot large enough to hold it and cover with cold water. Soak, for at least 12 hours or as long as 3 days, changing the water every 6 to 8 hours. This soaking will remove some of the excess salt. Place the pot on the stove with the ham and a fresh covering of water. Bring to a boil, reduce heat to low and simmer very slowly for 2 to 3 hours. Drain the ham and set it aside to rest. Preheat oven to 375°F. Slice away any excess fat and skin from the ham with a sharp knife, leaving a 1/2-inch thick covering of fat over the meat. Score fat in a cross-hatch pattern if you like, but avoid cutting into the meat. Place the ham, fat side up, on a rack in a roasting pan and bake until golden brown on the outside and the internal temperature reaches 155°F. This can take anywhere from 1 1/2 to 3 hours. Baste the ham with the collected pan juices every 20 minutes or so to help the ham brown. Remove the ham from the oven and set it aside to rest for at least 20 minutes. Place on a cutting board and slice thinly to serve. Cooking Your Ham Ahead: In order to save time, the ham can be boiled a couple days ahead of time and then baked the day you serve it. For more even cooking, let the ham come to room temperature for an hour before you place it in the oven. Other Cooking Shortcuts: Country hams can also be served after boiling alone. Or the boiling step can be eliminated, and the ham can go right from soaking to baking. You will need to extend the baking time to anywhere from 3 to 5 hours. Brown Sugar Glaze: Before you put the ham in the oven, in a small bowl mix together 1 cup brown sugar, 3 tablespoons cider vinegar, 3 tablespoons water and 1 tablespoon of dry mustard. Spread this mixture over your ham and cover it loosely with foil. Place the ham in the oven and bake as directed above. Remove the foil during the last 15 minutes of baking to allow the glaze to brown. Breadcrumb Coating: The ham can be given a coating of fresh breadcrumbs if you like. These make a nice, crispy brown coating on the finished ham. They also soak up some of the juices of the baking ham and are extra tasty. Christmas Flavor: Stud the ham with whole cloves if you like. If you cut the fat into a crosshatch pattern, place a clove in the center of each diamond of fat. Ham and Biscuits: Serve leftover slices of ham inside buttered biscuits as a sandwich. Fried Ham and Red-Eye Gravy: In a heavy skillet, fry slices of ham in grease or oil until browned. Remove the ham slices to a plate and pour off any excess grease. Pour 2 cups of strong coffee into the skillet and bring it to a boil, scraping up any of the drippings from the bottom. Pour the gravy over the ham and serve with biscuits to sop up any extra. 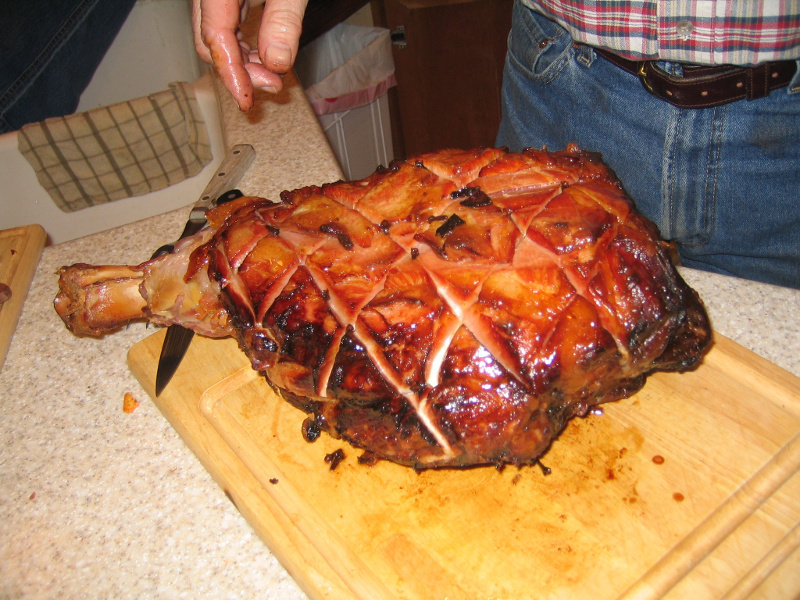 Hock Bone: Country hams usually come with the hock end of the bone still attached. Some cooks let it stick above the ham when it is boiling. Others have the butcher saw it off for them. But don't let him throw it away! Toss it in with your collard greens for incredible added flavor.